Stronglight 57 SC crank set! Here is one of my favorite crank sets. This one is on a bike we recently acquired. it is the model 57 SC (also called the 57 Super Competition) and was introduced in 1957, hence the name. It has a BCD of 122mm. It also incorporates a distinctive "star" pattern shaped spyder, however said spyder was now cast as part of the drive arm itself, forged as a single unit. It uses 8mm chain ring bolts with either domed or hex heads as opposed to later 10mm allen head chain ring bolts. They were available in 165- 175mm arm lengths and were intended for road / race use with an effective chain ring capacity of 38-56 teeth, almost exclusively set up as a double. These cranks just look AWESOME! I am glad we now have another set! I found this photo of Faliero Masi while going through some catalogs. At first I thought the photo was signed, upon closer inspection, it is a print of a signed photo. Still kinda cool. Here is a photo of Curtis out in front of the Lombard Street store. He looks like such a kid in this photo, not that he doesn't still look great! That was the original location of the business in Philadelphia, between 13th and Broad street in the 1980's. Yes, that is a REAL Bowden Spacelander in his hands. Very rare bike! This is a small oil painting a customer of ours did. It is the front of our store. I saw him while he was painting it across the street and wondered what he was painting. A short time later, he brought the wet painting in and gave it to Curtis. True story. 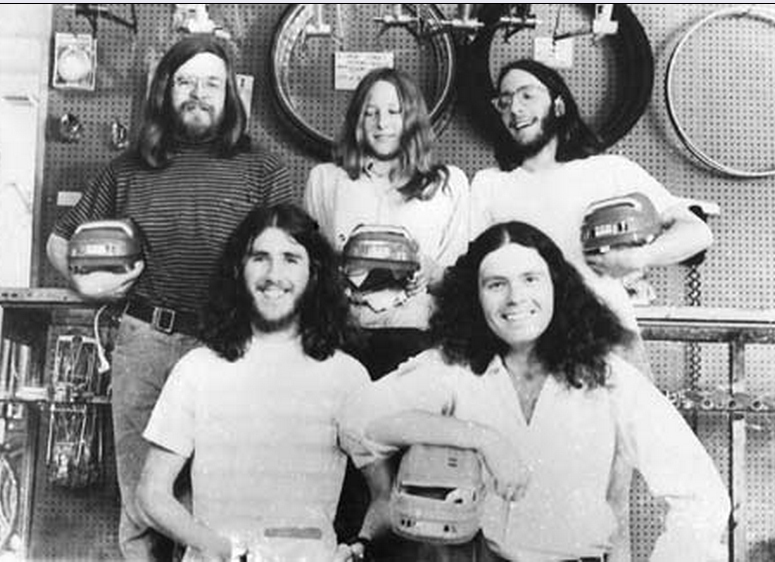 1972: Across the street from the University of Maryland, 3 young bike enthusiasts decided to make their own bikes and a booming business was begun. Proteus took a very hands-on, proletariat approach... you could buy a bike frame, or a bike frame kit, or have your kit's tubes mitered by Proteus, or have your bike painted after you made it at home! Simplex Tour de France spare parts kit. Amazing logo. 1950's Tour is WAY different than 2014 Tour de France. Almost all the spare parts are steel. I wonder how much steel is on a modern Tour de France bike? New Old Stock Huffy Aero Wind! I firmly believe in cycling. From its health benefits to the liberation it provides ones soul, to the positive impact it has on society as a whole and global well being. This is a special bike, those who have worked on them know what I mean. I have encountered many of these bikes over the years and they are difficult to work on, to say the least. This one however, is a time capsule new old stock example complete with owners manual and bar tape. Pretty cool. I guess. This is a rare opportunity to own a truly unique example. The television commercial speaks for itself. check it out: Huffy Aerowind TV commercial! Please email at: bikeville@gmail.com for price or with any insults and or heckling. Check out the last photo that shows how to true a wheel with an adjustable wrench! Good stuff. All jokes aside, this bike has its place in cycling history and would make an excellent addition to a collection. Here is a really nice Schwinn Paramount from about 1985. The paint is thick on the underside of the bottom bracket shell where the serial number is, making it impossible to read unless I scratch it off. Which of course I am not gonna do! It is built with Columbus SLX tubing which was introduced in 1985 on Paramounts, so that kind of informs me on a ballpark of production. By the looks of the construction I would also guess it was built at Waterford, not overseas. Some of the details are nicer than the Asian built bikes. However, I AM NOT 100% SURE because the serial number is obscured. All that being said, it is a great entry level race bike. It is set up with reliable components and has been well maintained over the years. 31 1/2" stand over height. The bike has 700C clincher rims. Front is a super Champion gentleman 81, the rear is a Mavic Module "E", Laced to Campagnolo high flange Nuovo Record hubs. Specialized 700 X 20mm tires. Tubes do not hold air and need to be replaced. 6 speed freewheel (Suntour), appears to be ultra 6 spacing. Shimano 600 front and rear derailleurs, crank set, and shifters.Suntour Superbe brake levers and calipers. Campagnolo Nuovo Record head set. SR Sakae seatpost and bar and stem combo. Stem is 100mm extension and bars are 39 CM wide CTC. Campagnolo Nuovo Record pedals with Christophe steel toe clips (large size) and blue leather Alfredo Binda toe straps. Black Burn bottle cage and foam bar tape / padding. The paint is a nce bright blue, cobalt I would say. Original decals are all there and in great shape. The seat tube Columbus SLX decal is a bit scratched, but totally legible. please email at: bikeville@gmail.com for price and any questions you may have. Thanks and enjoy!